Corporate renewable energy purchasing in the Commonwealth is an unmet need—with untapped potential. This state brief from Advanced Energy Economy explores the potential market for new renewable energy that could be unleashed if Virginia provides businesses with options to purchase the renewable energy they want to power their operations in the Commonwealth. 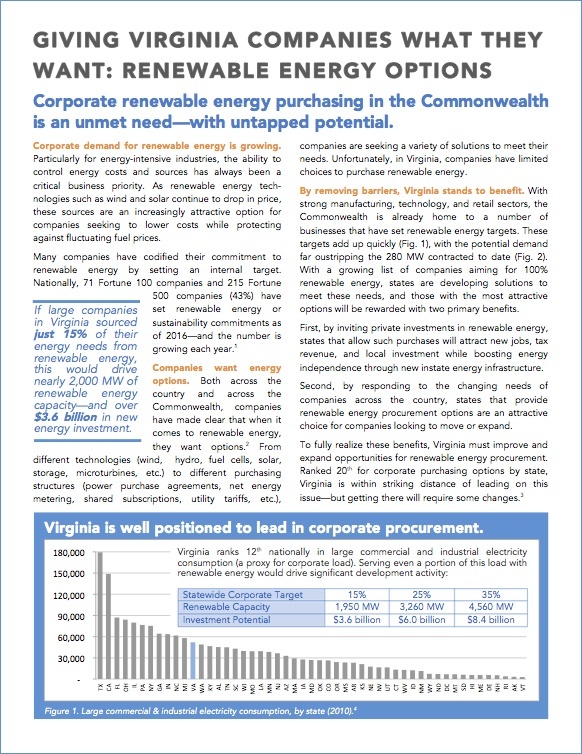 AEE’s brief considers the benefits of expanded opportunities for corporate renewable energy procurement, and explores some options that would work in Virginia, including improved renewable energy tariff offerings, power purchase agreements, and shared (or “community”) renewable energy subscription programs. Please complete the form to download the state brief.